This article is about SERE in the United States. For a similar course in the United Kingdom, see Defence Survive, Evade, Resist, Extract Training Organisation. Survival, Evasion, Resistance, and Escape (SERE) is a program, best known by its military acronym, that provides U.S. military personnel, U.S. Department of Defense civilians, and private military contractors with training in evading capture, survival skills, and the military code of conduct. Established by the U.S. Air Force at the end of World War II, it was extended and consolidated during the Vietnam War (1959–1975) to the U.S. Marine Corps, and U.S. Navy and in the late 1980s to the U.S. Army. Most higher level SERE students are military aircrew and special operations personnel considered to be at high risk of capture. Based on the experiences of the British and American pilots who managed to escape from and evade the Germans during World War II, and return to friendly lines, several private "clubs" were created during World War II. One such club was the "Late Arrivals' Club". This club, which had a "Flying Boot" as its identifying symbol, was strictly non-military. However, under the left collar of his uniform, the individual who had successfully escaped and/or evaded the enemy pinned the "Flying Boot" and although everyone knew it was not official, they did not question it being worn. However the origins of what we now call SERE are firmly rooted in the leadership of Britain’s MI9 Evasion and Escape organisation, formed in February 1939 at the onset of WW2. Led by WW1 veteran Colonel (later Brigadier) Norman Crockatt, MI9 were formed to train air crew and Special Forces in evading enemy troops following bale out, forced landings or becoming cut off behind enemy lines. A training school was established in London, and Officers and instructors from MI9 also began visiting operational air bases, providing local training to air crews unable to be detached from their duties to attend formal courses. MI9 went on to devise a multitude of evasion and escape tools. Overt items to aid immediate evasion after baling out, followed by Covert items (concealed compasses, silk and tissue maps etc.) hidden in uniforms and personal items for use to aid escape following capture. Once the United States entered the war in 1941, MI9 travelled to Washington to discuss their now mature E&E training, devices and proven results with USAAF. As a result, the United States stood up their own Evasion and Escape organisation, known as MIS-X, based at Fort Hunt, Virginia. Under the direction of Air Force General Curtis LeMay it was realized that it was much cheaper and more effective to train aircrews in Survival, Evasion, Resistance, and Escape techniques, than to have them languishing in enemy hands. He was responsible for SERE training at several bases/locations. In 1943, LeMay directed the establishment of a small program for Cold Weather Survival at RCAF Station Namao (formerly called Blatchford Field) in Alberta, Canada (There was a USAAF B29 unit assigned there and they attended Survival Training there with the British and Canadian Forces). In 1945 it was moved to Camp Carson, Colorado, and in 1948 at Marks Air Base, Nome, Alaska. The first instructors of the consolidated school were composed of experienced wilderness "civilian" volunteers and USAF military personnel with prior instructor experience. This initial cadre also included "USAF Rescuemen" from around Alaska, Colorado, Greenland, etc. General LeMay attended the first class of instruction as a student. As time wore on, the expense and wisdom of having multiple locations for training was questioned and consolidation was begun. The hardest decision of that consolidation was where to locate the training base that offered the best environmental and logistical support for such a small but convoluted training program. Ultimately, the USAF consolidated at Stead AFB, Nevada. In the mid 1960s, the school was moved to Fairchild AFB, WA. 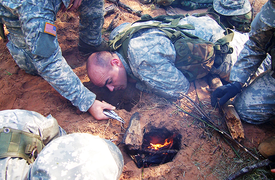 Most SERE training focuses on survival and evasion. Skills taught include Woodcraft and Wilderness Survival including Firecraft, Sheltercraft, Traps and Snares, Food & Water Procurement, Preservation and Purifying, Improvised Equipment, and also specific equipment and techniques of Rescue Sciences such as Distress signal, Navigation with and without an Escape and evasion map, Route Selection, Wilderness First Aid (a variant of the battlefield variety), techniques, methods of Evasion, and Communication Protocols, in all types of climate and terrain. US Army aviation SERE students create a Dakota hole to conceal a fire in order to better protect their position from enemy observation. Level C is held at Portsmouth Naval Shipyard, Kittery, Maine at the Navy Remote Training Site, Rangeley, and at Naval Air Station North Island, California at the Navy Remote Training Site, Warner Springs. This installation provides "Code of Conduct" that is necessary for Recon Marines, Marine Corps Scout Snipers, MARSOC Marines, Navy SEALs, enlisted Navy and Marine aircrewmen, Naval Aviators, Naval Flight Officers, Naval Flight Surgeons, Navy EOD, and Navy SWCC. As the "eyes" and "ears" of the commander, they carry knowledge of sensitive battlefield information. 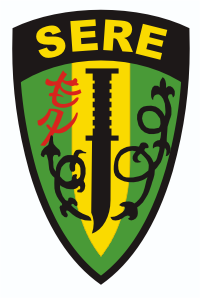 The largest SERE Course and only career-long SERE Instructor (now called SERE Specialists) cadre are located at US Air Force Survival School which is at Fairchild Air Force Base, Washington; each USAF SERE Specialist goes through a grueling selection process and if successful, attends the USAF SERE Specialist Training Course. Those that graduate (less than 10%) are awarded the Sage Beret, SERE Arch and SERE Flash. Following training, the Specialists are tasked with 45 weeks of intensive on-the-job training. Each graduate must attend Airborne School at the US Army Training Center located at Ft. Benning, GA. After completion of four years as an Instructor (Field Training) the Specialist may be tasked to train students worldwide. USAF SERE Specialists are required to complete an Associate's Degree in Survival and Rescue Sciences through the USAF Community College in order to continue to advance in their career field. SERE Specialists will complete additional qualification training at specialized schools as required. Examples are Scuba Courses, Military Freefall Parachuting, Altitude chamber, etc. Assignment to each of the outlying schools requires additional training by the SERE Specialist. Upon reporting to the new assignment, each SERE Specialist must first complete that school's course (the same as an Aircrew member), and then be trained by the school's cadre in the specialized subject matter (and carry crews under supervision) before the newly assigned Specialist is "qualified" to teach without supervision. At Edwards AFB, USAF SERE Specialists are tasked as "Test Parachutists" and required to perform multiple jumps on newly introduced / modified rescue systems, aircraft, and parachuting and / or ejection systems. This includes test parachuting newly designed canopies, harnesses, etc. Currently, they are the only Test Parachutists in the Department of Defense. Student training for Level "B" medical aircrew was conducted at Brooks City-Base, Texas until the planned course closure on 30 September 2009. The Air Force conducts Arctic Survival Training – Cool School at Eielson Air Force Base, Alaska, and Parachuting and Non-Parachuting Water Survival Training at Fairchild AFB, Washington. The parachute water survival training--which was once located in Florida--ceased operations there in August 2015. SERE training was also conducted at the US Air Force Academy in Colorado Springs from the late 1960s until 1995, enabling those USAF officers commissioned through USAFA to exempt from USAF SERE training at Fairchild AFB following undergraduate pilot or navigator training. In contrast, those USAF officers commissioned through AFROTC or OTS still had to complete SERE at Fairchild following flight training. 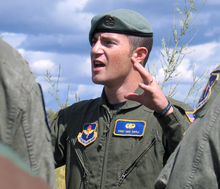 In 1995, the resistance/escape element of the course at USAFA was abolished (see Controversies below), leaving the survival and evasion classes in a program called Combat Survival Training (CST). The academy discontinued CST entirely in 2005. However, in summer 2008, some portions of the program, including resistance training, were reinstated. Following the summer of 2011, the scope of the CST program was reduced drastically and incorporated into the mandatory expeditionary skills training for budgetary reasons. Now, all USAFA graduates selected for pilot, air battle manager, or navigator training must complete SERE training at Fairchild after receiving their wings, along with their AFROTC and OTS graduate counterparts. USAF SERE Specialists are considered DOD-wide subject matter experts in their field. USAF SERE Specialists are assigned to base level and to command staff as advisers. The SERE techniques are commonly, but erroneously, believed to be modeled on abusive Chinese "brainwashing" practiced on U.S. POWs during the Korean War, to extract false confessions. Instead, most SERE techniques were modeled after 1950s and early 1960s CIA interrogation and psychological warfare practices. The CIA physical and psychological methods were originally codified in the Kubark Counterintelligence Interrogation Manual published in 1963, and in CIA torture training handbooks for Latin American regimes published in the 1970s and 1980s, and were employed during the Cold War, the CIA's Phoenix Program in Vietnam, and the Chilean intelligence organization DINA's Operation Condor in South America. The other primary source for SERE techniques was 1960s CIA "mind control experiments", using sleep deprivation, drugs, electric shock, and isolation and extended sensory deprivation. Certain of the less physically damaging CIA methods, derived from what was at the time called "defensive behavioral research", were reduced and refined as training techniques for the SERE program. In June 2006, an article on Salon, an online magazine, confirmed finding a document obtained by the American Civil Liberties Union through the Freedom of Information Act. A March 22, 2005, sworn statement by the former chief of the Interrogation Control Element at Guantánamo said SERE instructors taught their methods to interrogators of the prisoners in Cuba. The article also claims that physical and mental techniques used against some detainees at Abu Ghraib are similar to the ones SERE students are taught to resist. On December 9, 2014, the United States Senate Select Committee on Intelligence released a report further confirming the use of SERE tactics in interrogations. The contractors that developed the "enhanced interrogation techniques" received US$81 million for their services, out of an original contract worth more than US$180 million. NBC News identified the contractors, who were referred to in the report via pseudonyms, as Mitchell, Jessen & Associates from Spokane, Washington, which was run by two psychologists, John "Bruce" Jessen and James Mitchell. Jessen was a senior psychologist at the Defense Department who taught special forces on how to resist and endure torture. The report states that the contractor "developed the list of enhanced interrogation techniques and personally conducted interrogations of some of the CIA's most significant detainees using those techniques. The contractors also evaluated whether the detainees' psychological state allowed for continued use of the techniques, even for some detainees they themselves were interrogating or had interrogated." Mitchell, Jessen & Associates developed a "menu" of 20 enhanced techniques including waterboarding, sleep deprivation and stress positions. The CIA acting general counsel, described in his book Company Man, that the enhanced techniques were "sadistic and terrifying." ^ For example, the Senate Armed Services Committee Report on abuse of detainees at Guantanamo, Abu Ghraib, and CIA black site prisons reiterates the popular misconception that SERE techniques originated in Chinese Communist methods in the Korean War employed to extract false confessions from US POWs. Inquiry into the Treatment of Detainees in U.S. Custody, Report of the Committee on Armed Services of the U.S. Senate, November 20, 2008, 110th Cong. 2nd Sess. (U.S. Gov't Printing Office). ^ A 1956 U.S. Department of the Army report called physical and psychological abuse resulting in brainwashing a "popular misconception"; there was not a single reliable report of brainwashing. U.S. Department of the Army (15 May 1956). Communist Interrogation, Indoctrination, and Exploitation of Prisoners of War. U.S. Gov't Printing Office. pp. 17 & 51. Pamphlet No. 30-101. ^ McCoy, Alfred (2007). A Question of Torture: CIA Interrogation, from the Cold War to the War on Terror. Henry Holt & Co. pp. 10, 50–51, 71. ISBN 978-0-8050-8248-7. ^ Charles, Roger (2004-03-04). "AFA Scandals Confirm Senate Oversight Failure". DefenseWatch. Archived from the original on September 28, 2007. Retrieved 2007-07-31. ^ Mayer, Jane (2005-07-11). "THE EXPERIMENT: The military trains people to withstand interrogation. Are those methods being misused at Guantánamo?". The New Yorker. Retrieved 2009-04-02. ^ Benjamin, Mark (2006-06-29). "Torture teachers". Salon. Retrieved 2006-07-19. ^ Hina Shamsi; Deborah Pearlstein, ed. "Command's Responsibility: Detainee Deaths in U.S. Custody in Iraq and Afghanistan: Abed Hamed Mowhoush" Archived 2006-08-15 at the Wayback Machine, Human Rights First, February 2006. Accessed 4 August 2008. ^ Mark Mazzetti. "Ex-Pentagon Lawyers Face Inquiry on Interrogation Role". The New York Times, June 17, 2008. ^ Kleinman, Steven. "Officer: Military Demanded Torture Lessons". CBS News, July 25, 2008. ^ Rice, Condoleezza (September 26, 2008). "Rice admits Bush officials held White House talks on CIA interrogations". Los Angeles Times. ^ United States Senate Select Committee on Intelligence. "The Senate Committee’s Report on the C.I.A.’s Use of Torture". December 9, 2014. ^ Windrem, Robert. "CIA Paid Torture Teachers More than $80 Million". NBC News. Archived from the original on 9 December 2014. Retrieved 9 December 2014. David J. Morris (January 29, 2009). "Cancel Water-Boarding 101; The military should close its torture school. I know because I graduated from it". Slate. Wikimedia Commons has media related to Survival, Evasion, Resistance and Escape.